Designed with productivity in mind, the ViewSonic VX4380-4K combines incredible 4K resolution, a sleek narrow-bezel design, and an expansive 43" (42.5" viewable) screen so you can see all and do all from a single monitor. Featuring a true 10-bit SuperClear IPS panel and 3840x2160 resolution, this monitor delivers ultra-wide viewing angles and excellent color performance for best-in-class screen performance. Flexible and versatile for any office application ranging from document editing to graphic design, the VX4380-4K includes future-proof connectivity options such as DisplayPort 1.2, DisplayPort Out, HDMI 2.0, and 3-USB ports. 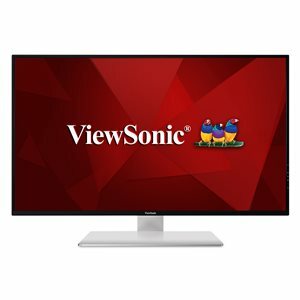 ViewSonic's MultiPicture functionality allows for efficient multitasking by providing simultaneous viewing of up to four split windows, while full ergonomic functionality delivers maximum comfort and enhanced productivity. With an energy-saving Eco-mode feature, ENERGY STAR 7.0 compliance, and EPEAT Silver certification, the VX4380-4K delivers great power savings while boosting productivity for a variety of business applications. diagonal screen size 43 in. dimensions 12.8" x 31.1" x 2.6"
This monitor features MultiPicture support for multi-tasking and simultaneous viewing of up to 4 video sources at Full HD 1080p resolution. Picture-in-Picture (PIP) and Picture-by-Picture (PBP) functionali-ty is also available for increased productivity. Designed with productivity in mind, the ViewSonic® VX4380-4K combines incredible 4K resolution, a sleek narrow-bezel design, and an expansive 43” (42.5" viewable) screen so you can see all and do all from a single monitor. Featuring a true 10-bit SuperClear® IPS panel and 3840x2160 resolution, this monitor delivers ultra-wide viewing angles and excellent color performance for best-in-class screen performance. Flexible and versatile for any office application ranging from document editing to graphic design, the VX4380-4K includes future-proof connectivity options such as DisplayPort® 1.2, DisplayPort® Out, HDMI® 2.0, and 3-USB ports. ViewSonic’s MultiPicture™ functionality allows for efficient multitasking by providing simultaneous viewing of up to four split windows, while full ergonomic functionality delivers maximum comfort and enhanced productivity. With an energy-saving Eco-mode feature, ENERGY STAR® 7.0 compliance, and EPEAT® certification, the VX4380-4K delivers great power savings while boosting productivity for a variety of business applications. With EPEAT Certification, this monitor delivers a reduced environmental impact over the complete product lifecyle, making it a great eco-friendly, long-term investment.